Long before there were faces of meth and Lindsay Lohan DUIs, there were plenty of regular troublemakers stealing things and getting busted. 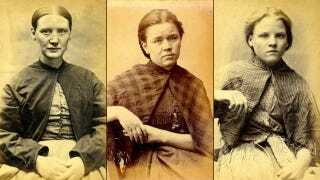 These mugshots from the Newcastle City Gaol and House of Correction in England, which were taken between 1871 and 1873, offer a fascinating look into the life of ordinary women criminals. They look like they had hard lives and plenty to contend with—and some of them still possess the power to send a chill down your spine 130-something years later. Ann Kirk was caught thieving money from people on several occasions, but this time in 1873, Ann was sentenced to 3 months in Newcastle City Gaol. Alice Mullholland was a hawker from Newcastle and was sentenced to 3 months in Newcastle City Gaol after being convicted of stealing some boots. Isabella Smith was sentenced to 6 weeks at Newcastle City Gaol for stealing poultry. Agnes Stewart was a married lady from Edinburgh and was convicted of the crime - theft of money. Along with Mary Catherine Docherty, Ellen Woodman and Mary Hinnigan, Rosanna Watson was sentenced to 7 days hard labour after being caught stealing iron. Elizabeth Rule (AKA Elizabeth Smith, Elizabeth Brown) was convicted of stealing clothing and bed linen 5 times between 1867 and 1872. For these convictions she served a total of 11 months 14 days. Catherine Flynn was sentenced to 6 months at Newcastle City Gaol for the conviction of the crime - stealing money from person. Mary Patterson was sentenced to 6 weeks in 1873 for theft of poultry. After stealing a waistcoat Ann Burns was sentenced to 1 month imprisonment. Sarah Cassidy was convicted of stealing money and served 2 months with hard labour. In the previous two years she had been convicted 6 times for breaking by laws and had already served 42 days in prison.